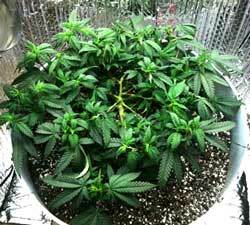 LST allows you to train your marijuana plants to grow into basically any shape. This gives you the power to force any strain to grow short, giving you the ability to grow a short Sativa or Haze, strains which normally grow too tall and stretchy to get good yields indoors. To do this, you physically force the plant by providing no other options. 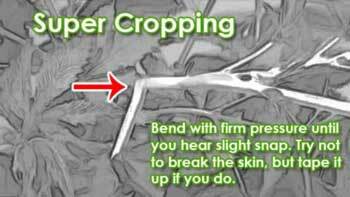 You actually bend and gently manipulate your plants to grow into your desired shape, like an artist or scuptor. You can use basically anything to tie plants down. I highly recommend getting a spool of twisty tie or garden wire (soft, bendable wire, specifically made for the garden) to tie your plants down with. Garden wire is soft and pliable, yet strong. This allows you to quickly hook the wire around branches and secure the other end to whatever you want, without hurting your plants. Yet you don't need special garden wire to be successful. You can use anything from string to paper clips. Feel free to get creative! After you attach one end to the part of the plant you want to train, the other end can be tied to weights, to the pots your plants are in, your hydroponics bucket, or most anything. 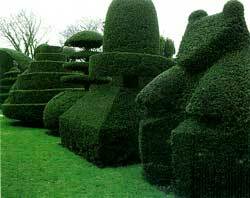 In the best case scenario, you want to keep everything self-contained, so you can easily move your plant around later. Step 1: Top or FIM your young plant when she’s only got 3-5 nodes. Step 2: Spread out your branches so they lie flat and secure them. Especially in the very beginning, think of creating a "star" shape with your plant. The branches should be gently pulled down to lay as flat as possible. If you’ve LST’ed properly during the vegetative stage, your plant will naturally grow rows of colas along the top of whatever shape plant you've created. As you continue to spend time training and observing your plants, you’ll gain an even better understanding of how marijuana plants grow. LST is more of an art form than a science, and it’s time for you to bring out your inner artist! Interested in LED grow lights? LED grow lights are supposed to be the "wave of the future," yet why is it so hard to get real information about them? Will they save me money in the long run? 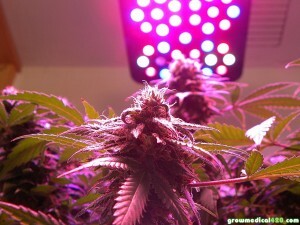 Check out this week-by-week grow journal of the Pro-Grow X5-300 LED grow light and get your questions answered today! Are LEDs hard to use? Can I just set it and forget it? Marijuana Grow Lights – Which One Is Best?